A global leader in manufacturing from Germany opened the doors of their North America headquarters in Windsor. Kauth North America showed off its new facility at 3485 Wheelton Drive in Windsor on Thursday. “Initially, this new location will serve as Kauth North America’s distribution and warehousing center with up to 25 employees with plans to eventually evolve and expand to include a manufacturing facility that will employ up to 350 employees overtime,” says Christian Kauth, CEO and owner of Kauth. Kauth is a family owned business and was founded in 1928 by Paul Kauth in Denkingen, Germany. Kauth has six manufacturing facilities globally with over 900 employees and specializes in stamping and forming, developing and producing formed parts with integrated extruded holes, sub-assemblies and attachment systems. Their client base consists of BMW, Daimler, Volkswagen, Audi, Chevrolet and Magna. Officials say Kauth combines great experience with state-of-the-art production processes, making them the technology leader in the field of tube and forming technology and an ideal partner to develop fastening solutions. “Kauth conducted an extensive search in a number of communities throughout North America and determined that Windsor provides the best business case and advantages to assist us to achieve our goals and growth in North America," says Kauth. Kauth also has plans to build a 300-thousand square feet stamping factory. “We want to start with production in 2020 and for the moment we are in the planning,” says managing director Steffan May. “We hope all will be finished and we get permission so we can start next year with the building." Windsor mayor Drew Dilkens says the locating of Kauth North America to the City of Windsor represents a significant investment in Windsor’s economy and its people. 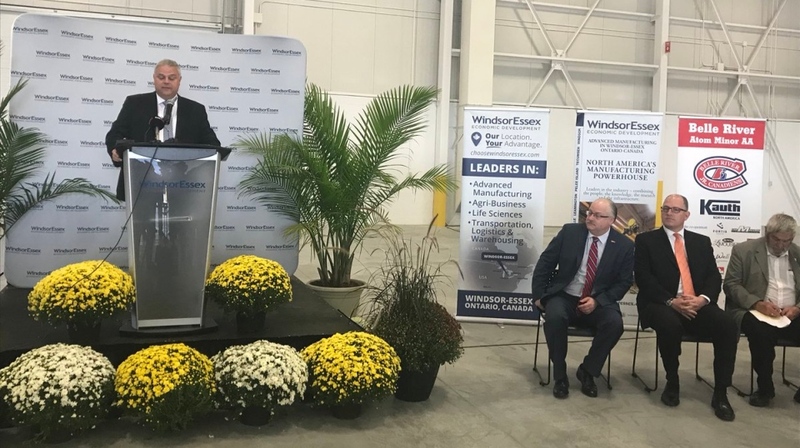 CEO WindsorEssex Economic Development Corporation Stephen MacKenzie, says he’s pleased to welcome Kauth North America to the Windsor-Essex family of companies. “In addition to them employing state-of-the-art production processes, they have already been meeting with our companies region-wide to explore procuring tool and dies, welding cells and stamping presses for possible future expansion,” says MacKenzie.